It’s #ForceFriday, and thanks to the awesome folks at Wonder Forge, we have one copy of the Star Wars: The Force Awakens Star Destroyer Strike Game to giveaway. In this game, strategy is needed to win. Advance your Resistance heroes toward safety, but move fast—the Star Destroyer Finalizer is on your tail. The spinning starship of the dreaded First Order can aim in any direction, and you may be in the line of fire! Bounce the beam off the mirrored deflector shield toward your enemies, and evade the surprise laser blasts. It’s fast-moving, family fun in a galaxy far, far away. The game is rated for ages 6 and up, and retails for $24.99. 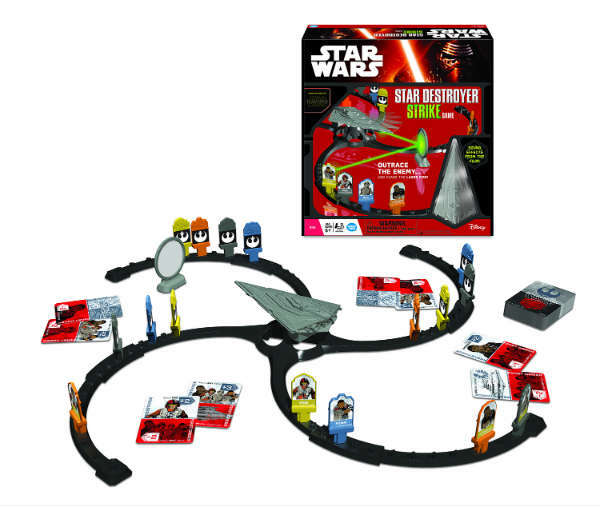 If you don’t want to take a chance of winning the game, you can purchase the Star Wars: The Force Awakens Star Destroyer Strike Game at Target, which has the exclusive. But if you do want to play with Lady Luck, here’s how to enter our giveaway. Simply use the Rafflecopter form below to enter. You can even earn extra entries by doing things like tweeting about this contest. Deadline to enter is 11:59pm (ET) on Friday, September 11, 2015. Winner will be drawn at random from all valid entries during the contest duration, and notified via email. The prize will be shipped from Wonder Forge. Han Solo ~ He’s so cool!! R2D2 is my favourite character!